In 2018 Valletta received the title of the European Capital of Culture. In this regard, the European Foundation for Support of Culture organized a number of big projects – “Days of Maltese Music ” all around the world. 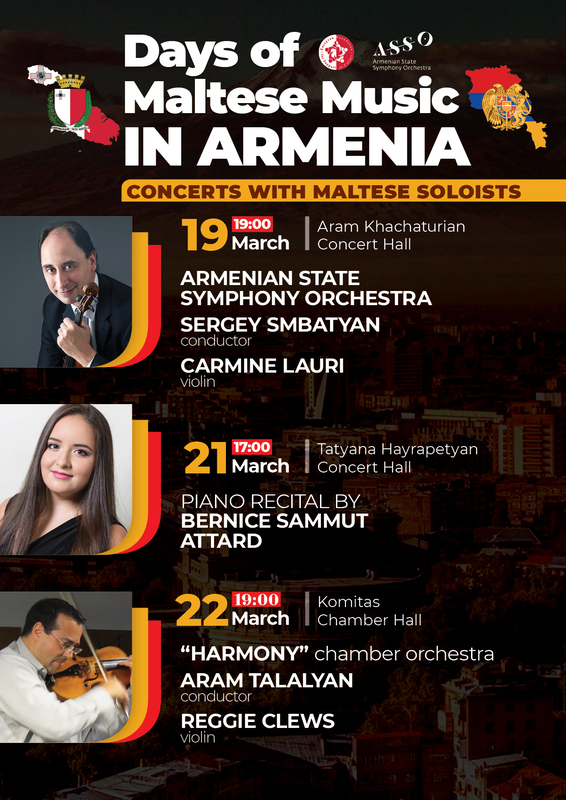 In March 2019, from 19 to 22, “Days of Maltese Music ” would be held in Yerevan , the capital of Armenia in the best concert halls of the city such as the Aram Khachaturian Concert Hall and others. The project would unite famous Maltese and Armenian musicians. On 19 March in the frames of the cultural project would be held a classical music concert featuring famous Maltese violinist Carmine Lauri and Armenian Symphony Orchestra under the baton of Honored artist of Armenia maestro Sergey Smbatyan. Maltese composers will be performed, such as Joseph Vella, Charles Camilleri, Karl Fiorini, Alexey Shor, Albert Garcia, as well as music of famous Armenian composers and others.